Ozhotels is a group of independently owned and non-related hotels, resorts and serviced apartments situated in the holiday destination of Mooloolaba on the Queensland Sunshine Coast. Ozhotels allows you to deal directly with the apartments and resorts, therefore giving you the best possible rates for this Mooloolaba accommodation. 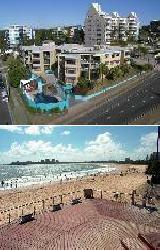 So book your next resort or apartment holiday accommodation in Mooloolaba online and get great discount rates. 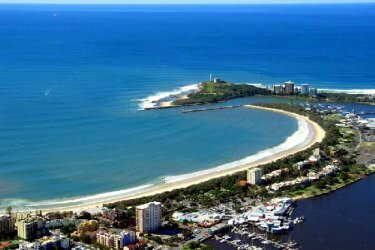 The region of Mooloolaba on the Queensland Sunshine Coast is an extremely popular holiday destination for international tourists, families and couples looking for a romantic getaway. It features a large variety of places to stay from self contained holiday apartments and luxury resorts through to budget hotels and motels. Because there is wuch a wide range of accommodation in Mooloolaba many people find is rather difficult and time consuming task to find a place that is right for their specific needs. This is where the use of an accommodation expert like OzHotels can really be handy. They will allow you to compare hundreds of different properties that are situated all over Mooloolaba and find the one that meets your needs and travel budget. The main advantages of booking online with OzHotels is that you can book your travel a long time in advance and that you will get an extra discount off the already cheap rates the longer that you holiday in Mooloolaba. Being 50 metres north of the main shopping and restaurant strip the Windward Apartments Mooloolaba is only a short stroll to the numerous boutiques, restaurants, coffee shops, clubs, bars, surf club and wharf. This Mooloolaba accommodation is also close to Underwater World, where you can come face to face with 25,000 underwater creatures as well as a 3.5 metre grey nurse shark. A short drive from this discount Mooloolaba Holiday Apartments allows guests to experience the famous Eumundi Markets, Australia Zoo, the Sunshine Coast Hinterland including the picturesque Montville and the Heritage listed Fraser Island. The Windward Apartments in Mooloolaba provides both families and couples with great value for money holiday apartment accommodation on the spectacular Queensland Sunshine Coast. 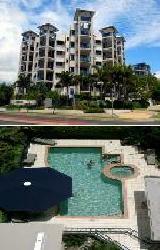 For more Mooloolaba Apartments click here. The Bay View Harbour Views Apartments offer a range of 2 & 3 bedroom self contained serviced apartments in the heart of the beautiful Sunshine Coast. The Bay View Harbourview Apartments are located just one street back from the bustle of the Mooloolaba Esplanade and only 5 minutes walk to beaches at Mooloolaba and Alexandra Headland. The Bay Views Harbourview Apartments in Mooloolaba is close to everything that theis is to offer, as well as having a numerous guests facilities and services including direct internet access, faxing facilities, free car parking, guest laundry, outdoor swimming pool, tour desk, bbq, garden and baby cots available. 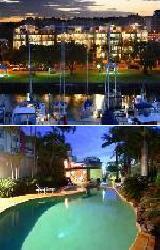 The Bay View Harbour View Mooloolaba Resort also caters for corporate travellers with a range of business facilities. The Mantra Mooloolaba Beach has a wide selection of 1, 2 & 3 bedroom apartments that are idealy located right on the doorstep of Mooloolaba's restaurant, cafe and shopping strip, as well as being right on the waterfront along the famous Mooloolaba Esplanade. The Mantra Mooloolaba Beach Apartment Resort offers the ideal Mooloolaba accommodation and is perfect as a base to explore the beautiful Sunshine Coast. It also features lots of facilities and services such as a lounge bar, business centre, conference centre, internet access, faxing facilities, free car parking, gym, lift, restaurant, sauna, spa, outdoor swimming pool, tour desk, bbq, garden, indoor pool, 24 hour reception and baby cots for hire. Perfectly situated just metres from the cosmopolitan Mooloolaba Esplanade and stunning beach the Cilento Resort is close to everything that the city has to offer. It provides modern 1, 2 & 3 bedroom self contained serviced apartments that are located on top of a shopping centre that features a wide array of cafes, restaurants and boutique shopping. The Cilento Resort Mooloolaba is a luxury holiday resort that is quietly positioned in First Avenue in the heart of Mooloolaba. It also has numerous guests facilities and services including direct internet access, free car parking, guest laundry, gym, lift, spa, outdoor swimming pool, tour desk, bbq, garden and baby cots for hire. The Raffles Mooloolaba offers travellers the choice of luxury 1, 2 & 3 bedroom self contained serviced apartments just 200m from beach, cafes & shopping. One of the few properties in Mooloolaba that has soundproof rooms, Raffles Mooloolaba Apartments Resort is located just 50 metres off the western end of the esplanade, which is Mooloolaba's renowned cafe and restaurant strip and across the road from the supermarket. 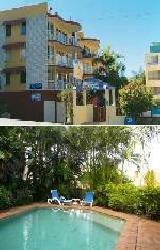 The Raffles Mooloolaba provides all types of travellers with discount accommodation in Mooloolaba. It also features a wide range of modern amenities and services such as direct internet access, faxing facilities, free car parking, lift, spa, tour desk, bbq, airport shuttle and security access. Throw away the keys and walk to everything from alfresco dining, coffee shops, boutiques and of course the patrolled Mooloolaba Beach. 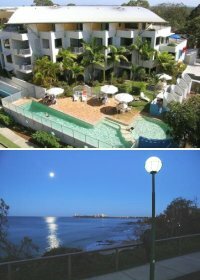 There is an atmosphere of relaxation and tranquillity at the Beachside Apartments Mooloolaba. The property provides holiday makers with self contained 1 bedroom serviced apartments accommodation that is within easy walking distance to the magnificent Mooloolaba Beachand the cosmopolitan Mooloolaba Esplanade with its numerous clubs, cafes and fine dining restaurants. 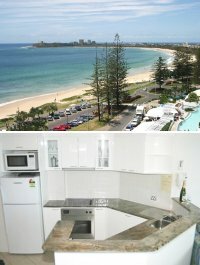 The Beachside Apartments Mooloolaba provides all types of travellers with discount accommodation on the Sunshine Coast. It also features a wide range of modern amenities and services such as free car parking, spa, outdoor heated swimming pool, tour desk, landscaped gardens, bbq facilities with entertaining area and security access. A proudly family run resort, the Beachside Apartments Mooloolaba prides itself on providing a providing a warm friendly atmosphere. Oceans Mooloolaba Serviced Apartments is within easy walking distance of the patrolled area of one of the best beaches you'll ever experience. Similarly, you will also find close by many alfresco eateries and coffee shops together with a range of boutique fashion shops, galleries and gift shops as well as The Wharf and a major theme park. The Oceans Mooloolaba Apartment Resort is perfectly positioned directly opposite Mooloolaba Beach and in the center of Mooloolaba Esplanade. Oceans Mooloolaba Serviced Apartments offers exquisite apartments and penthouses with spectacular 180 degree views across Mooloolaba Bay to Point Cartwright and north as far as Noosa. The stunning interior furnishings and unrivalled resort features set Oceans Mooloolaba Resort apart from the rest of the accommodation on the Sunshine Coast. 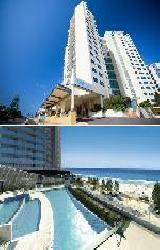 Oceans Mooloolaba also offers unrivalled resort features to make your holiday experience a very special one. The Newport Apartments Mooloolaba is located next door to Underwater World, which is Queensland's largest oceanarium and aquarium. 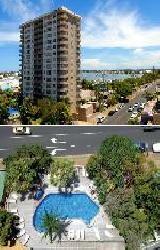 Also the Mooloolaba Wharf Complex and Mooloolaba Beach is only one-minute walk from the Newport holiday apartments. This resort is designed for holidaying, offering value for money and friendly service, combined with breathtaking views of the ocean and marina from you own private balconies. The spacious studios, 1, 2 or 3 bedroom fully self-contained apartments are non smoking with modern and designer furniture. Guests at this Mooloolaba accommodation will enjoy strolling along The Esplanade in front of the Newport Resort Apartments, as well as the beachfront alfresco dining and retail therapy in the many boutiques, specialty stores and galleries nearby. 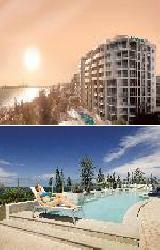 At the Newport Apartments Mooloolaba you can swim in the heated pool, relax in the spa or sauna, enjoy a BBQ with friends, soak up the views or let the kids play in the playground. Newport Mooloolaba Resort Apartments is within walking distance to all the best attractions Mooloolaba offers and is a great beach resort from which to explore the rest of the Sunshine Coast. The Bellardoo Holiday Apartments are ideally located on the Esplanade at Mooloolaba Beach and just a few minutes walk to Mooloolaba's boutique shopping, cosmopolitan style bistro's and award winning restaurants. 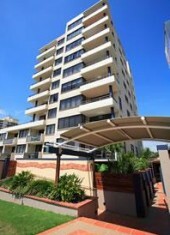 This quality Mooloolaba accommodation is within easy access to everything that the Sunshine Coast has to offer. Bellardoo Holiday Apartment Resort has a selection of 1 and 2 bedroom self contained non smoking Sunshine Coast apartments available with discount rates for long term stays. Guests at Bellardoo can either relax by the heated pool and spa or visit the pristine beach which is close by. Further resort facilities includes an electric barbeque area, airport transfers and tour desk. The Sailport Mooloolaba Apartment Resort offers luxury 1, 2 & 3 bedroom apartments overlooking the Mooloolaba Wharf and Marina. This Mooloolaba accommodation conveniently positioned only 100 meters to the Mooloolaba Surf Club, the safe patrolled Mooloolaba Beach and the delightful Esplanade with its numerous boutiques and restaurants. The Sailport Mooloolaba Apartments Resort is a delightful 4 storey building nestled along the water frontages amongst tree lined parks and BBQ facilities, offering uninterrupted views of tranquillity and relaxation. Sailport Mooloolaba apartments offers discount holiday rates for longer stays, as well as a choice of fully self contained 1, 2, & 3 bedroom apartments. Guest facilities include a heated swimming pool, children's pool, rejuvenating spa, BBQ, entertaining area, Free individual lock up garage, security entry, tour desk, business services and friendly onsite managers. The central location allows you to catch the free bus to Australia Zoo or go across the road to Underwater World and The Wharf complexes. Central to all the Sunshine Coast attractions and in the heart of Mooloolaba Beach, the Sailport Mooloolaba Accommodation is the perfect place to stay. The Caribbean Resort offers the ideal luxury Mooloolaba accommodation for holiday makers wishing to venture out and explore all the treasures that are on offer. Most major tourist and entertainment attractions are within either walking distance of the Caribbean Resort. This Mooloolaba accommodation resort is located in the heart of the Queensland's Sunshine Coast, less than one hours drive south of Noosa, and only 20 minutes drive north to Caloundra. Laid back charm and style place Mooloolaba in a class of it's own and it's numerous restaurants, bars and pristine beach is what makes it so popular. The Caribbean Resort Mooloolaba provides its very own patrolled surf beach and at the resort there is a swimming pool, heated rock spa pool, rooftop spa and BBQ area, children's wading pool, fully equipped gymnasium, Cocktail Lounge Bar & Restaurant. The Beach Club Resort Apartments Mooloolaba provide holiday makers and travellers to the Sunshine Coast with great value apartments accommodation right in the heart of Mooloolaba. These fully furnished and stylished appointed apartments conveniently situates only 400 metres from Mooloolaba Beach and 150 metres from the Mooloolaba Esplanade with its array of shops, cafes and restaurants. These Mooloolaba apartments are air-conditioned and feature a fully equipped kitchen, private laundry, cable TV, DVD player and a private balcony or patio. 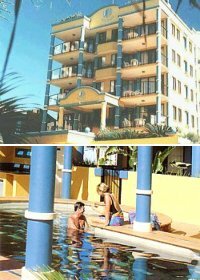 There are also 2 tropical swimming pools, sauna, spa and gymnasium available at the Beach Club Resort Apartments Mooloolaba. or stroll over to Mooloolaba beach for a peaceful walk along the Pacific Ocean's edge. There are a multitude of activities that you can experience on your next Sunshine Coast holiday including visiting the Australia Zoo, the Big Pineapple, Underwater World, Aussie World and Olympia theme parks or diving on the ex HMAS Brisbane which is located 2km offshore. 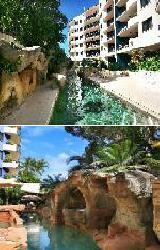 Wonderfully cheap Mooloolaba accommodation which offers discount apartment rates online. The Aegean Apartments Mooloolaba are just 60 metres from the famous north facing patrolled Mooloolaba Beach. This Mooloolaba accommodation is also situated within a hub comprising superb restaurants, resort shops and the congenial Mooloolaba Surf Club. The modern four star boutique complex of five storys offers you the choice of one or two bedroom apartments. All of the apartments are self contained, air conditioned and feature private balconies, most of which offer spectacular ocean/marina or pool views. 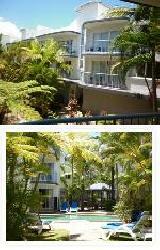 The Malibu Apartments offer spacious, quality Mooloolaba accommodation in the heart of Queensland's Sunshine Coast. 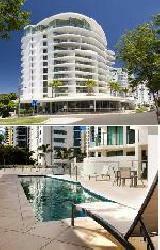 The Malibu Mooloolaba is right on the Mooloolaba Esplanade immediately across from the famous Mooloolaba Beach. This Mooloolaba beachfront accommodation in the very heart of Mooloolaba with all of the apartments directly facing the ocean with a guaranteed ocean view for all. These 2 bedroom and 2 bathroom holiday apartments are situated in a fabulous central location, the Mooloolaba Esplanade which is alive day and night with an impressive array of restaurants, cafes, boutiques, night clubs, bars and clubs.